The Northern Lights have fascinated human beings for millennia. In fact, their existence has informed the mythology of many cultures, including the Inuit, Northern Cree, and ancient Norse. They were also a source of intense fascination for the ancient Greeks and Romans, and were seen as a sign from God by medieval Europeans. Thanks to the birth of modern astronomy, we now know what causes both the Aurora Borealis and its southern sibling – Aurora Australis. Nevertheless, they remain the subject of intense fascination, scientific research, and are a major tourist draw. For those who live north of 60° latitude, this fantastic light show is also a regular occurrence. Aurora Borealis (and Australis) is caused by interactions between energetic particles from the Sun and the Earth’s magnetic field. The invisible field lines of Earth’s magnetoshere travel from the Earth’s northern magnetic pole to its southern magnetic pole. When charged particles reach the magnetic field, they are deflected, creating a “bow shock” (so-named because of its apparent shape) around Earth. 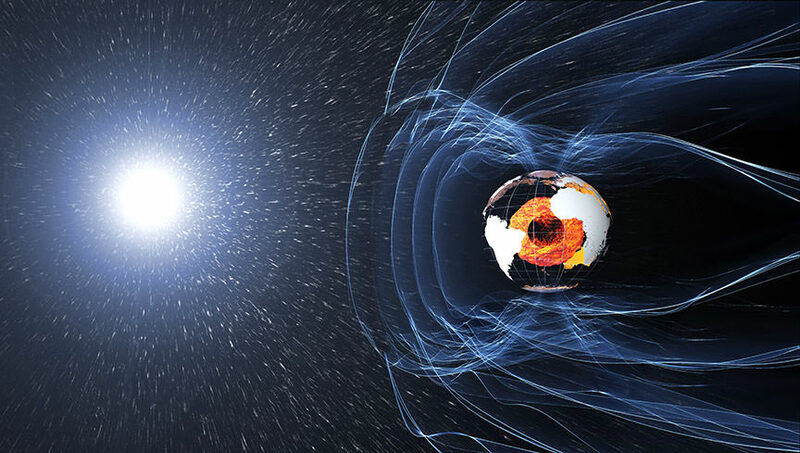 However, Earth’s magnetic field is weaker at the poles, and some particles are therefore able to enter the Earth’s atmosphere and collide with gas particles in these regions. These collisions emit light that we perceive as wavy and dancing, and are generally a pale, yellowish-green in color. The variations in color are due to the type of gas particles that are colliding. The common yellowish-green is produced by oxygen molecules located about 100 km (60 miles) above the Earth, whereas high-altitude oxygen – at heights of up to 320 km (200 miles) – produce all-red auroras. Meanwhile, interactions between charged particles and nitrogen will produces blue or purplish-red auroras. The visibility of the northern (and southern) lights depends on a lot of factors, much like any other type of meteorological activity. Though they are generally visible in the far northern and southern regions of the globe, there have been instances in the past where the lights were visible as close to the equator as Mexico. In places like Alaska, Norther Canada, Norway and Siberia, the northern lights are often seen every night of the week in the winter. Though they occur year-round, they are only visible when it is rather dark out. Hence why they are more discernible during the months where the nights are longer. A Solar Maximum also accords with bright regions appearing in the Sun’s corona, which are rooted in the lower sunspots. Scientists track these active regions since they are often the origin of eruptions on the Sun, such as solar flares or coronal mass ejections. The most recent solar minimum occurred in 2008. As of January 2010, the Sun’s surface began to increase in activity, which began with the release of a lower-intensity M-class flare. The Sun continued to get more active, culminating in a Solar Maximum by the summer of 2013. The ideal places to view the Northern Lights are naturally located in geographical regions north of 60° latitude. These include northern Canada, Greenland, Iceland, Scandinavia, Alaska, and Northern Russia. Many organizations maintain websites dedicated to tracking optimal viewing conditions. For instance, the Geophysical Institute of the University of Alaska Fairbanks maintains the Aurora Forecast. This site is regularly updated to let residents know when auroral activity is high, and how far south it will extend. Typically, residents who live in central or northern Alaska (from Fairbanks to Barrow) have a better chance than those living in the south (Anchorage to Juneau). In Northern Canada, auroras are often spotted from the Yukon, the Northwest Territories, Nunavut, and Northern Quebec. However, they are sometimes seen from locations like Dawson Creek, BC; Fort McMurry, Alberta; northern Saskatchewan and the town of Moose Factory by James Bay, Ontario. For information, check out Canadian Geographic Magazine’s “Northern Lights Across Canada“. The National Oceanic and Atmospheric Agency also provides 30 minute forecasts on auroras through their Space Weather Prediction Center. And then there’s Aurora Alert, an Android App that allows you to get regular updates on when and where an aurora will be visible in your region. Understanding the scientific cause of auroras has not made them any less awe-inspiring or wondrous. Every year, countless people venture to locations where they can be seen. And for those serving aboard the ISS, they got the best seat in the house! We have written many interesting articles about Auroras here at Universe Today. Here’s The Northern and Southern Lights – What is an Aurora?, What is the Aurora Borealis?, What is the Aurora Australis?, What Causes the Northern Lights?, How Does the Aurora Borealis Form?, and Watch Fast and Furious All-sky Aurora Filmed in Real Time. For more information, visit the THEMIS website – a NASA mission that is currently studying space weather in great detail. The Space Weather Center has information on the solar wind and how it causes aurorae. Astronomy Cast also has episodes on the subject, like Episode 42: Magnetism Everywhere. My, the Sun is a violent place. I mean, we knew that already, but there’s even more evidence for that using new data from a brand-new NASA spacecraft. There’s talk now about tornadoes and jets and even “bombs” swirling amid our Sun’s gassy environment. A huge set of results from NASA’s Interface Region Imaging Spectrograph (IRIS) spacecraft reveals the true nature of a mysterious transition zone between Sun’s surface and the corona, or atmosphere. Besides the pretty fireworks and videos, these phenomena are telling scientists more about how the Sun moves energy from the center to the outskirts. And, it could tell us more about how stars work in general. The results are published in five papers yesterday (Oct. 15) in Science magazine. Below, a brief glimpse of what each of these papers revealed about our closest star. It’s a twist! You can see some structures in the chromosphere, just above the Sun’s surface, showing gas spinning like a tornado. They spin around as fast as 12 miles (19 kilometers) a second, which is considered slow-moving on the Sun. The paper is here (led by Bart De Pontieu, the IRIS science lead at Lockheed Martin in California). This is a question we are often asked: what is the difference between a coronal mass ejection (CME) and a solar flare? We discussed it in a recent astrophoto post, but today NASA put out a video with amazing graphics that explains it — and visualizes it — extremely well. CMEs are giant clouds of particles from the Sun hurled out into space, while flares are flashes of light — occurring in various wavelengths — on the Sun. You can find even more details from NASA here. “Then I posterized it and ran it through the “posterize edges” filter which really brings out many details,” Rick said via email. Rick admitted to some confusion about the difference between solar flares and coronal mass ejections, and so we figured this might be a good time to explain. They do have several similarities, however: both solar flares and CMEs are energetic events on the Sun that are both associated with high energy particles, and they both depend on magnetic fields on the Sun. In the case of a CME, coronal material is ejected into space at high speeds. According to Berkeley University the most obvious difference between a solar flare and a CME is the spatial scale on which they occur. “Flares are local events as compared to CMEs which are much larger eruptions of the corona,” says the Berkeley webpage, and sometimes a CME can be larger than the Sun itself. Solar flares and coronal mass ejections often occur together, but each can also take place in the absence of the other. While this solar peak has been weaker than usual, from time to time we get a moderate punch from the Sun. Here’s an example — what NASA calls a “mid-level” solar flare blasting off the Sun at 8:16 a.m. EDT (1:16 p.m. UTC) yesterday (Aug. 26). While the related coronal mass ejection can cause auroras high in Earth’s atmosphere and (in more severe cases) cause telecommunications disruptions, in this case the U.S. government isn’t expecting much. “Given the location of this event, the associated coronal mass ejection is well off the Sun-Earth line and no significant geomagnetic storming is anticipated as a result,” wrote the National Weather Service’s Space Weather Prediction Center in an update today. NASA says the flare, which was captured by the Solar Dynamics Observatory, is an M5 flare. X-class flares are about 10 times more powerful than M-class ones. An unrelated solar event recently caused auroras that astronauts spotted from the International Space Station. With a watchful NASA spacecraft capturing its moves, the Sun sent off a “mid-level” solar flare on Tuesday (July 8) that you can watch (over and over again) in the video above. The Solar Dynamics Observatory caught the explosion around 12:20 p.m. EDT (4:20 p.m. UTC), which led into a coronal mass ejection that sent a surge of solar material into space. 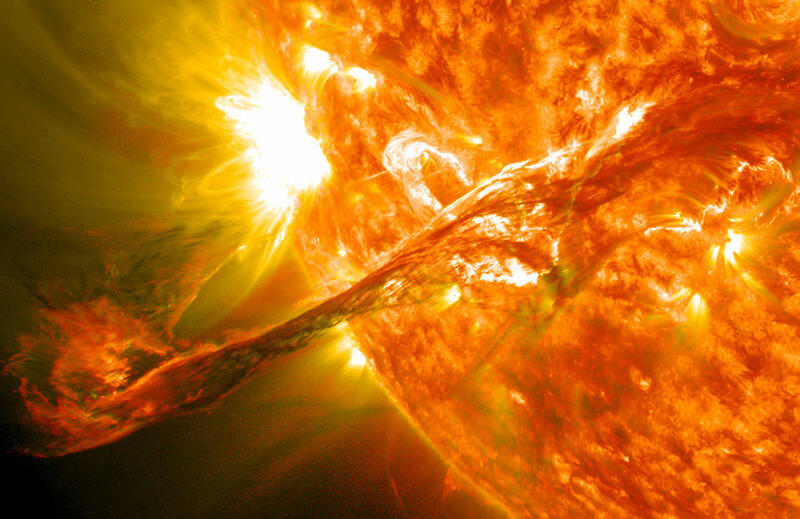 Solar flares can be disruptive to Earth communications and also cause auroras in the atmosphere. In this case, the M6 solar flare created “short-lived impacts to high frequency radio communications on the sunlit side of Earth … as a result,” wrote the National Oceanic and Atmospheric Administration in a forecast July 8. In this case, however, the coronal mass ejection (seen by the Solar Dynamics Observatory) is not expected to hit Earth. But with the Sun around its maximum of solar activity in the 11-year cycle, other eruptions could head into space in the coming days. M is considered a moderate flare and X the strongest kind.